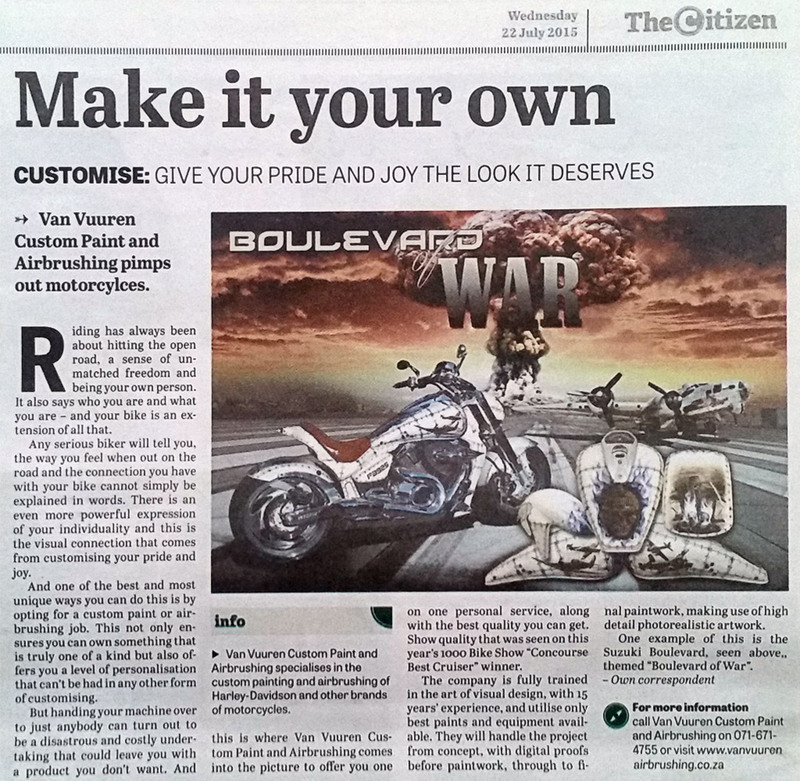 van Vuuren Custom Paint & Airbrushing's presence in the media is being established as a leader in the field of custom paint and airbrushing. 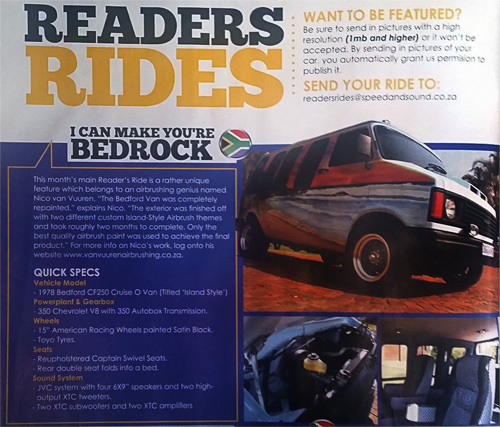 Read what the media has to say about van Vuuren Custom Paint & Airbrushing. This month's main Reader's Ride is a rather unique feature which belongs to an airbrushing genius named Nico van Vuuren. 'The Bedford Van was completely repainted." Explains Nico. "The exterior was finished off with two different custom Island-Style Airbrush themes and took roughly two months to complete. Only the best quality airbrush paint was used to achieve the final product." For more info on Nico's work, log onto his website www.vanvuurenairbrushing.co.za. - 350 Chevrolet V8 with 350 Autobox Transmission. -15" American Racing Wheels painted Satin Black. - Reupholstered Captain Swivel Seats. - Rear double seat folds into a bed. Van Vuuren Custom Paint and Airbrushing pimps out motorcycles. Riding has always been about hitting the open road, a sense of unmatched freedom and being your own person. It also says who you are – and your bike is an extension of all that. Any serious biker will tell you, the way you feel when out on the road and the connection you have with your bike cannot simply be explained in words. There is an even more powerful expression of your individuality and this is the visual connection that comes from customizing your pride and joy. And one of the best and most unique ways you can do this is by opting for a custom paint or airbrushing job. This not only ensures you can own something that is truly one-of-a-kind but also offers you a level of personalization that can’t be had in any other form of customizing. But handing your machine over to just anybody can turn out to be a disastrous and costly undertaking that could leave you with a product you don’t want. And this is where Van Vuuren Custom Paint and Airbrushing comes into the picture to offer you one-on-one personal service, along with the best quality you can get. Show quality that was seen on this year’s 1000 Bike Show “Concourse Best Cruiser” winner. The company is fully trained in the art of visual design, with more than 15 years’ experience, and utilize only best paints and equipment available. They will handle the project from concept, with digital proofs before paintwork, through to final paintwork, making use of high detail photorealistic artwork. One sample of this is the Suzuki Boulevard, seen above, themed “Boulevard of War”.